The entire Zenfone 2 range is powered by Intel Atom chipsets, and the ZE551ML we have at the office has an Atom Z3560 SoC with its quad-core processor clocked anywhere between 500MHz and 1.83GHz, depending on the work load. 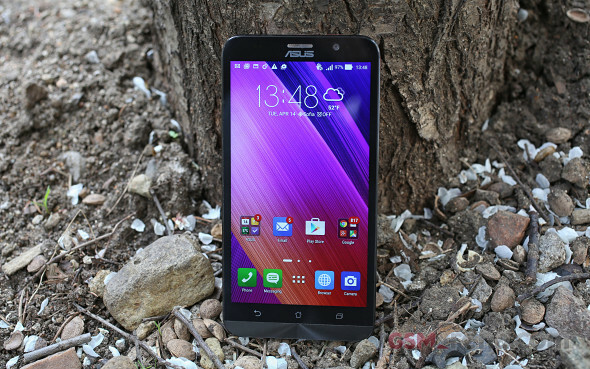 Update, June 11: We have added the benchmark scores of the range-topping Asus ZenFone 2 with 4GB of RAM. In addition to more memory, it packs a more powerful Intel Atom Z3580 SoC with 2.3 GHz quad-core CPU. For comparison, Asus ZenFone 2 with 2GB of RAM features Intel Atom Z3560 with 1.8GHz quad-core CPU. 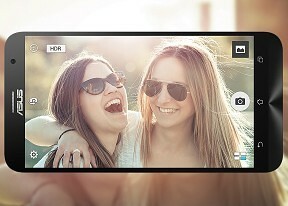 The 4GB Asus ZenFone 2 delivered mostly impressive performance across the board, leaving many flagship devices behind it on more than one occasion. As expected, the 4GB variant is also noticeably faster than its sibling with 2GB of RAM. Intel's offerings can hardly impress with numbers in the Android realm, where higher-clocked octa-core processors have become the norm. However, the Atom Z3560 proved to be able to compete with the Snapdragon 800 and its quad-core 2.26GHz processor, back when we reviewed the Asus Memo Pad ME572C, a similarly specced tablet. Our review unit comes with 2GB of RAM, which should be about enough for smooth daily usage. Demanding power users, who do a lot of multitasking may choose to go with the top model that comes with 4GB and the faster Atom Z3580, albeit at a price premium. We tried to pick a few of the Zenfone 2's market rivals, which are frankly hard to pinpoint, but also threw in the current crop of flagships to see how it compares to the leading performers out there. We'll start with the CPU centric Geekbench 3.0 test. As expected, the Zenfone 2 doesn't impress with raw CPU performance and is miles behind the 1.7GHz octa-core Meizu m1 note. The Samsung Galaxy Note 3 with S800 together with the Oppo Find 7a and OnePlus One both powered by S801 are ahead as well. Still, the Zenfone 2 manages to inch ahead of both LG G2 and G3 and is superior to the Galaxy Note 3 Neo. Antutu 5 adds RAM and storage speed into the mix and is an indication of the overall performance of the device. The Zenfone 2 delivers a strong performance, on par with the Galaxy Note 3 with S800 and the LG G3 with S801. The even broader Basemark OS II benchmark continues the trend. Overall, the Zenfone 2 performs well, if far from the top of the current flagship crop. Again, the Galaxy Note 3 and G2 remain behind. As expected though, the CPU focused parts of the benchmark weren't the Atom's strong suit and it was bolted to bottom of the comparison charts. In the graphics department, the Zenfone 2 is equipped with a PowerVR G6430 GPU as Intel doesn't make its own graphics chips for the Atoms. It's a somewhat old GPU, released back in Q3 2013, made by British semiconductor manufacturer Imagination Technologies. It was featured in Apple's A7 SoC inside the iPhone 5S, and is chosen by Intel for the entire range of Z35xx Atoms. GFXBench returned the same results in both the off-screen and on-screen routines, not exactly surprising, having in mind that the standardized off-screen tests are carried out at 1080p resolution, the same as the actual one on the Zenfone 2. The GPU puts out solid numbers in the T-Rex test beating the Galaxy Note 3 and the LG G3 and G2. Even the Galaxy Note 4 is a frame behind in the on-screen test, but don't forget its QHD resolution. The more intense Manhattan routine halves the framerate but even so the Zenfone 2 posts great results. Apart from the Galaxy S6 and the Snapdragon 810s, no one proves to be a match. Basemark X is a bit less flattering on the Zenfone, but in this company it still performs admirably. Of the old dogs only OnePlus One is ahead, and not by much. To wrap up, the Zenfone 2 ZE551ML proves to be a strong performer, even in this compromise configuration with 2GB of RAM and Intel Atom Z3560. While it may not be on par with the latest and greatest, it outperforms established flagship names from the previous generation and shows no apparent weaknesses. We can only imagine what the top model would have shown in these tests with double the operating memory and higher maximum clock speed.